While going to high school in Tulsa, OK, Ted Shackelford had a percolating interest in acting, but it wasn’t until he graduated from the University of Denver that he gave community theater a try. Thoroughly infected by the acting bug, Shackelford moved to New York City and worked as the night manager of The Carlyle Hotel while waiting for his big break. That came in 1975 when he landed the role of Ray on ANOTHER WORLD. The gig lasted almost two years and was followed by myriad guest-starring appearances on prime-time shows. In 1979, Shackelford replaced another actor to play J.R. Ewing’s alcoholic brother, Gary, on DALLAS, which led to the megasuccessful spin-off, KNOTS LANDING. Shackelford played Gary for 14 years until the series was canceled in 1993. Shackelford stayed busy in episodic guest spots, as well as appearing on stage before returning to daytime to portray Y&R’s upright and uptight DA, William Bardwell. 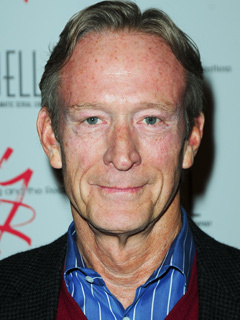 Shackelford was let go over a year later when his character died after a debilitating stroke, only to come back a month later to play William’s snaky and sneaky twin brother, Jeffrey. His full name is Theodore Tillman. His dad was a naval officer and a doctor. Before working together on KL, he and his former TV wife Joan Van Ark (ex-Val) co-starred on an episode of WONDER WOMAN in 1978. During his tenure as Y&R's William, he wore the same three suits, which he owned. Jeffrey has not been seen around Genoa City for a while now but we'll see Gloria's ne're-do-well hubby again on July 8, which means his portrayer, Ted Shackelford, who reprised the role of Gary Ewing on the rebooted DALLAS, is also back! Kudos to Y&R for keeping Ted Shackelford's return as Jeffrey under wraps. In one of the closing scenes on the December 6 episode, Jeffrey is seen on what appears to be a deserted island. YOUNG AND RESTLESS has announced that Kin Shriner (ex-Scotty, GH) will temporarily replace Ted Shackelford in the role of Jeffrey Bardwell. No reason was given for the sudden casting except that Shackelford "is not available" for the episodes that will air in late April.